The MS2717B Economy Microwave Spectrum Analyzer is designed to be an affordable solution for bench testing of microwave components, subsystems, and systems. Designed for engineers and technicians needing advanced yet economical spectrum analysis tools, the MS2717B redefines the economy class by delivering impressive value and lowering cost-of-test. The MS2717B can be enhanced with up to 15 wireless options for testing protocols from GSM to Mobile WiMAX and TD-SCDMA. The MS2717B offers a full suite of measurement features such as RMS detection, extensive marker functions, including counted markers, and marker noise measurements, limit testing, and AM/FM/SSB demodulator and more. A quasi-peak detector is standard and CISPR bandwidths allow for EMC pre-compliance testing. The MS2717B can have an optional tracking generator to support filter and amplifier measurements. To simplify measurements and ensure accuracy, several smart measurements are built into the MS2717B, including channel power, adjacent channel power ratio, carrier to interference ratio (C/I), and field strength. An AM/FM/SSB demodulator is included. It also offers unexpected performance bonuses such as 65 dB range input step attenuator and 20 watt input protection which can significantly reduce the concern of damage by inexperienced operators. Optional high accuracy power meter functionality supports Anritsu’s 6 GHz PSN50 sensor with +_0.16 dB power measurement accuracy. The MS2717B also offers optional wide 10 MHz capture bandwidth, optional W-CDMA/HSDPA RF measurements and W-CDMA demodulation for simplifying test of Node-B transmitters, and optional WiMAX RF measurements and demodulation to support fixed WiMAX installation. 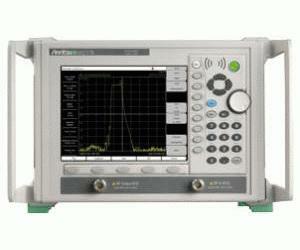 The MS2717B spectrum analyzer has low phase noise of -110 dBc/Hz typical at 1 GHz @ 10 kHz offset, best in its class typical DANL of -159 dBm at 1 GHz in a 1 Hz RBW, resolution bandwidth (RBW) range of 1 Hz to 3 MHz and video bandwidth (VBW) range of 1 Hz to 3 MHz. It also has the fastest sweep speeds of any spectrum analyzer in its class. The use of Compact Flash memory modules and USB Flash Drives allow an unlimited number of traces and setups to be stored. Measurements may be stored directly to the compact flash module. A 512 MB module will hold over 20,000 Spectrum Analyzer measurements. Remote programming using the Ethernet 10/100 Base-T connection is provided using SCPI programming. The Ethernet connection gives the user flexibility in remotely operating the instrument using Anritsu''''''s remote access software, shipped with the product. Measurements and setups may be uploaded and downloaded using either the Ethernet or the USB connection. The MS2717B is shipped with a User Guide, a CD ROM containing Master Software Tools and USB driver, a USB A-mini B cable, an Ethernet Cable, a 256 MB USB Flash Drive, a 256 MB Compact flash drive, a type-N male to SMA female adapter, a type-N male to BNC female adapter. Every MS2717B has a one year warranty for parts and labor and is shipped with a certificate of calibration & conformance. AM, FM and SSB demodulation with built-in speaker and headset jack.